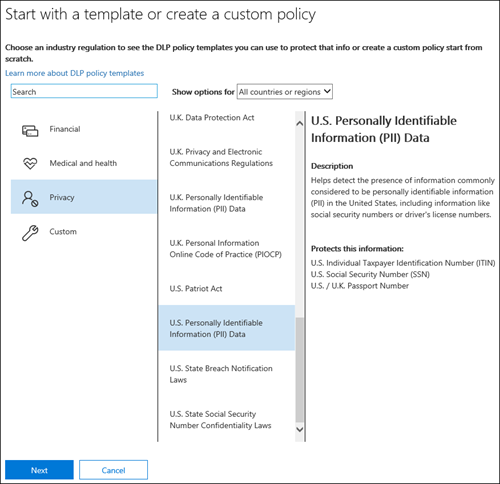 The easiest, most common way to get started with DLP policies is to use one of the templates included in Office 365. You can use one of these templates as is, or customize the rules to meet your organization's specific compliance requirements. You can fine tune a template by modifying any of the existing rules or adding new ones. For example, you can add new types of sensitive information to a rule, modify the counts in a rule to make it harder or easier to trigger, allow people to override the actions in a rule by providing a business justification, or change who notifications and incident reports are sent to. A DLP policy template is a flexible starting point for many common compliance scenarios. You can also choose the Custom template, which has no default rules, and configure your DLP policy from scratch, to meet the specific compliance requirements for your organization. OneDrive for Business accounts make it easy for people across your organization to collaborate and share documents. But a common concern for compliance officers is that sensitive information stored in OneDrive for Business accounts may be inadvertently shared with people outside your organization. A DLP policy can help mitigate this risk. Add a couple of types of sensitive information—U.S. bank account numbers and U.S. driver's license numbers—so that the DLP policy protects even more of your sensitive data. Make the policy more sensitive, so that a single occurrence of sensitive information is enough to restrict access for external users. Allow users to override the actions by providing a business justification or reporting a false positive. This way, your DLP policy won't prevent people in your organization from getting their work done, provided they have a valid business reason for sharing the sensitive information. Sign in to Office 365 using your work or school account. You're now in the Office 365 Security & Compliance Center. In the Security & Compliance Center > left navigation > Data loss prevention > Policy > + Create a policy. Choose the DLP policy template that protects the types of sensitive information that you need > Next. In this example, you'll select Privacy > U.S. Personally Identifiable Information ‎(PII)‎ Data because it already includes most of the types of sensitive information that you want to protect—you'll add a couple later. When you select a template, you can read the description on the right to learn what types of sensitive information the template protects. Name the policy > Next. Choose All locations in Office 365 > Next. Choose Let me choose specific locations > Next. For this example, choose this. 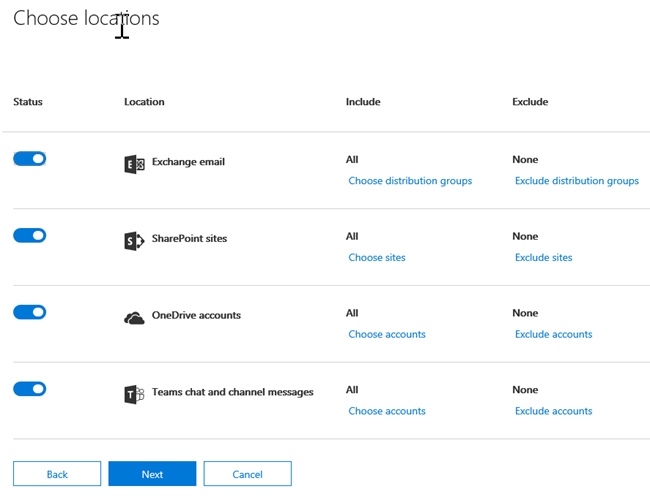 To include or exclude an entire location such as all Exchange email or all OneDrive accounts, switch the Status of that location on or off. To include only specific SharePoint sites or OneDrive for Business accounts, switch the Status to on, and then click the links under Include to choose specific sites or accounts. When you apply a policy to a site, the rules configured in that policy are automatically applied to all subsites of that site. 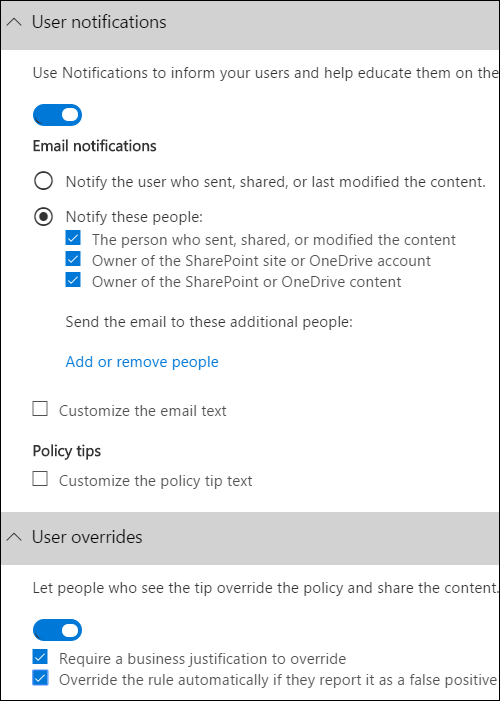 In this example, to protect sensitive information stored in all OneDrive for Business accounts, turn off the Status for both Exchange email and SharePoint sites, and leave the Status on for OneDrive accounts. Choose Use advanced settings > Next. A DLP policy template contains predefined rules with conditions and actions that detect and act upon specific types of sensitive information. You can edit, delete, or turn off any of the existing rules, or add new ones. When done, click Next. Low volume of content detected U.S. PII This rule looks for files containing between 1 and 10 occurrences of each of three types of sensitive information (ITIN, SSN, and U.S. passport numbers), where the files are shared with people outside the organization. If found, the rule sends an email notification to the primary site collection administrator, document owner, and person who last modified the document. High volume of content detected U.S. PII This rule looks for files containing 10 or more occurrences of each of the same three sensitive information types, where the files are shared with people outside the organization. If found, this action also sends an email notification, plus it restricts access to the file. 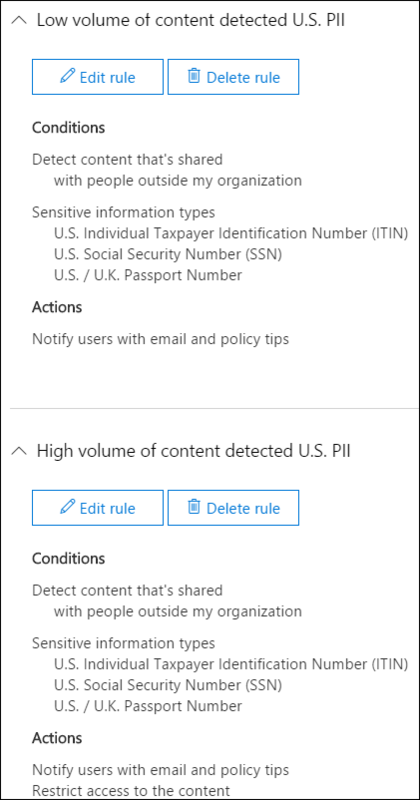 For content in a OneDrive for Business account, this means that permissions for the document are restricted for everyone except the primary site collection administrator, document owner, and person who last modified the document. To meet your organization's specific requirements, you may want to make the rules easier to trigger, so that a single occurrence of sensitive information is enough to block access for external users. After looking at these rules, you understand that you don't need low and high count rules—you need only a single rule that blocks access if any occurrence of sensitive information is found. So you expand the rule named Low volume of content detected U.S. PII > Delete rule. Now, in this example, you need to add two sensitive information types (U.S. bank account numbers and U.S. driver's license numbers), allow people to override a rule, and change the count to any occurrence. You can do all of this by editing one rule, so select High volume of content detected U.S. PII > Edit rule. 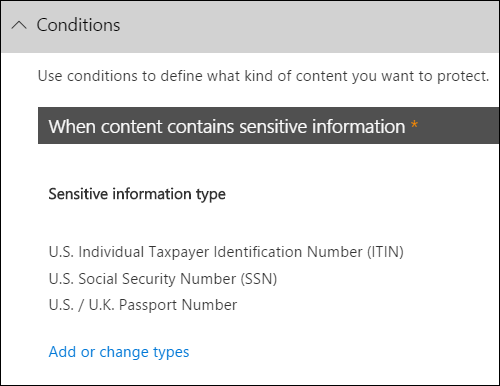 To add a sensitive information type, in the Conditions section > Add or change types. Then, under Add or change types > choose Add > select U.S. Bank Account Number and U.S. Driver's License Number > Add > Done. 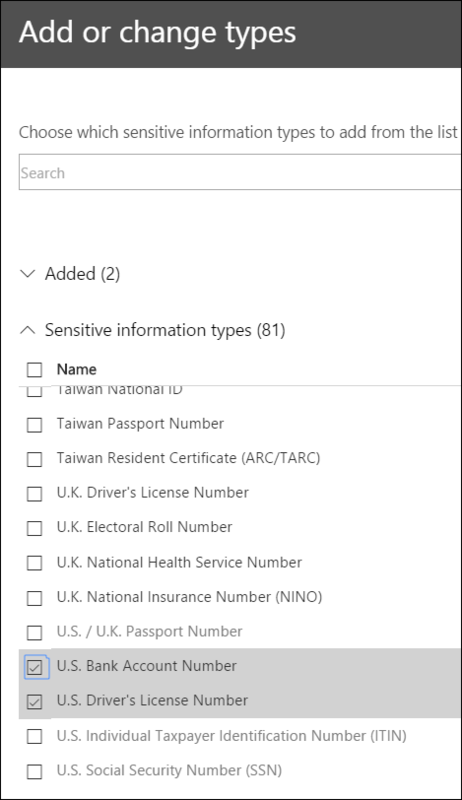 To change the count (the number of instances of sensitive information required to trigger the rule), under Instance count > choose the min value for each type > enter 1. The minimum count cannot be empty. The maximum count can be empty; an empty max value convert to any. When finished, the min count for all of the sensitive information types should be 1 and the max count should be any. In other words, any occurrence of this type of sensitive information will satisfy this condition. For the final customization, you don't want your DLP policies to block people from doing their work when they have a valid business justification or encounter a false positive, so you want the user notification to include options to override the blocking action. In the User notifications section, you can see that email notifications and policy tips are turned on by default for this rule in the template. In the User overrides section, you can see that overrides for a business justification are turned on, but overrides to report false positives are not. Choose Override the rule automatically if they report it as a false positive. 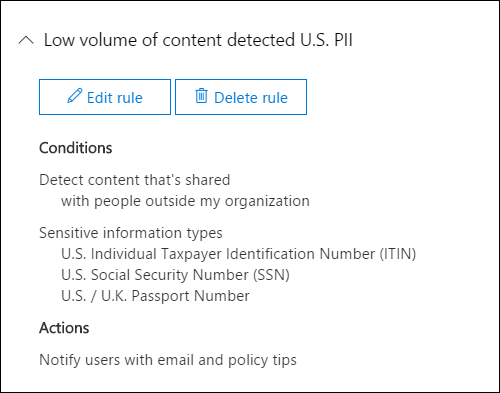 At the top of the rule editor, change the name of this rule from the default High volume of content detected U.S. PII to Any content detected with U.S. PII because it's now triggered by any occurrence of its sensitive information types. At the bottom of the rule editor > Save. Review the conditions and actions for this rule > Next. On the right, notice the Status switch for the rule. 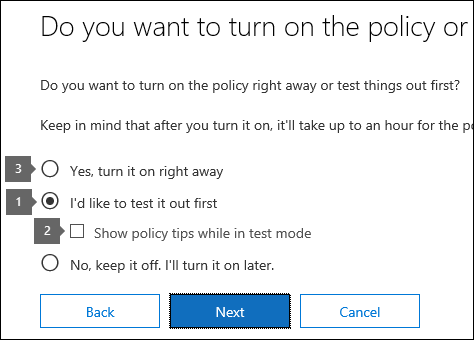 If you turn off an entire policy, all rules contained in the policy are also turned off. However, here you can turn off a specific rule without turning off the entire policy. This can be useful when you need to investigate a rule that is generating a large number of false positives. On the next page, read and understand the following, and then choose whether to turn on the rule or test it out first > Next. Before you create your DLP policies, you should consider rolling them out gradually to assess their impact and test their effectiveness before you fully enforce them. For example, you don't want a new DLP policy to unintentionally block access to thousands of documents that people require to get their work done. Start in test mode without Policy Tips and then use the DLP reports to assess the impact. You can use DLP reports to view the number, location, type, and severity of policy matches. Based on the results, you can fine tune the rules as needed. In test mode, DLP policies will not impact the productivity of people working in your organization. Turn on the policies so that the rules are enforced and the content's protected. Continue to monitor the DLP reports and any incident reports or notifications to make sure that the results are what you intend. Review your settings for this policy > choose Create. 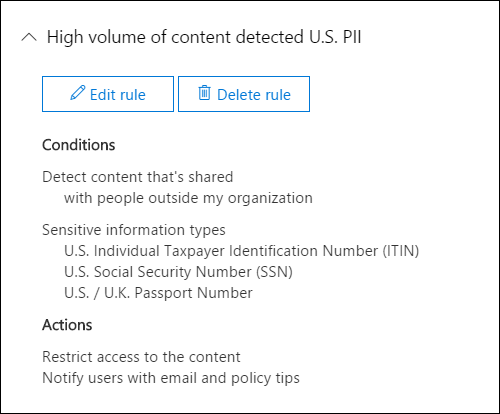 After you create and turn on a DLP policy, it's deployed to any content sources that it includes, such as SharePoint Online sites or OneDrive for Business accounts, where the policy begins automatically enforcing its rules on that content. 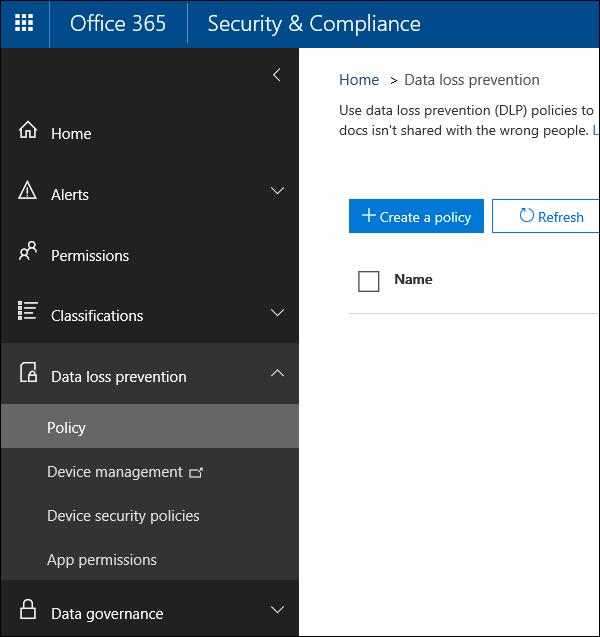 At any time, you can view the status of your DLP policies on the Policy page in the Data loss prevention section of the Security & Compliance Center. Here you can find important information, such as whether a policy was successfully enabled or disabled, or whether the policy is in test mode. Here are the different statuses and what they mean. The policy is being deployed to the content sources that it includes. The policy is not yet enforced on all sources. The policy is in test mode. The actions in a rule are not applied, but policy matches are collected and can be viewed by using the DLP reports. Notifications about policy matches are sent to the specified recipients. The policy is in test mode. The actions in a rule are not applied, but policy matches are collected and can be viewed by using the DLP reports. Notifications about policy matches are not sent to the specified recipients. The policy is active and enforced. The policy was successfully deployed to all its content sources. The policy is being removed from the content sources that it includes. The policy may still be active and enforced on some sources. Turning off a policy may take up to 45 minutes. The policy is not active and not enforced. The settings for the policy (sources, keywords, duration, etc) are saved. The policy is in the process of being deleted. The policy is not active and not enforced. You can edit or turn off a DLP policy at any time. Turning off a policy disables all of the rules in the policy. 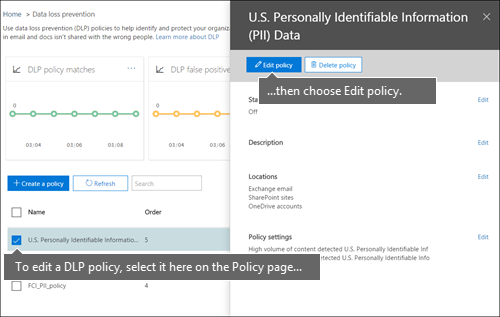 To edit or turn off a DLP policy, on the Policy page > select the policy > Edit policy. In addition, you can turn off each rule individually by editing the policy and then toggling off the Status of that rule, as described above.